Charitable and nonprofit sector modernization has been the subject of much recent debate and discussion in Canada. The federal government has signalled significant interest in renewing its relationship with the sector. Recent consultations with sector stakeholders have resurfaced a recurring theme – the importance of creating an enabling environment for the sector. But what could such an enabling environment look like, how do you get there and where do you start? This paper is the first in Mowat NFP’s Enabling Environment Series, which explores the different dimensions of an ‘Enabling Environment’ in the relationship between the charitable and non-profit sector and government. 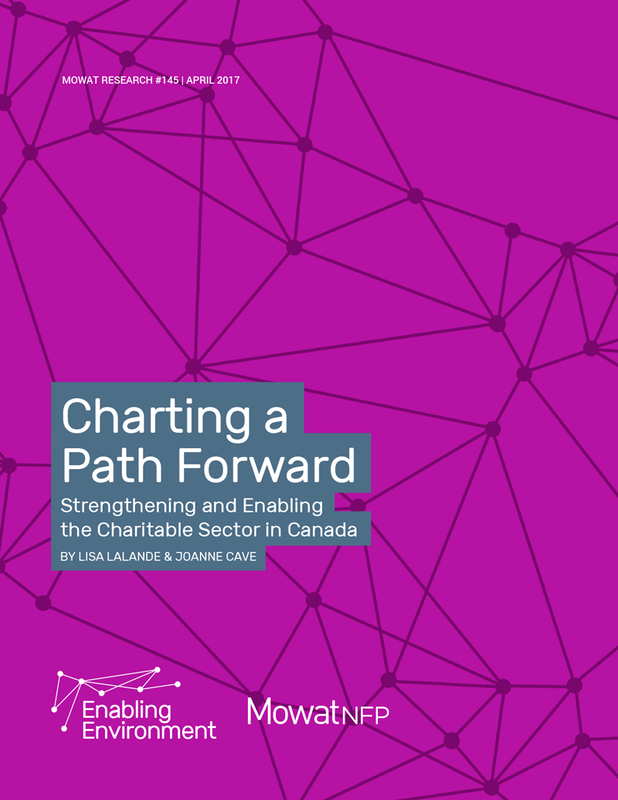 The paper defines the current challenge in the relationship between the federal government and the nonprofit and charitable sector; explores what an enabling environment could look like; identifies possible priorities; and presents different ways that the government and the sector can work together. Nonprofits and charities provide opportunities for individuals to express their beliefs and values, improve their conditions and create stronger communities through their work in areas such as arts and culture, education, sports and recreation. The sector has proven to be an important partner to governments in providing health, housing, immigration, child welfare and other essential services to Canadians. Charities and nonprofits play a crucial role in shaping policies and laws that reflect the current needs and values of Canadians. In doing so, the sector is a vital partner in maintaining a healthy and productive democracy. The sector has made efforts to evolve to meet rising demands, but Canada’s current systems, structures, policies and legislation could be viewed as risk-averse, outdated and constraining, limiting opportunities for innovation, experimentation, revenue generation and cross-sector collaboration. The resulting mismatch between organizational realities of nonprofits and charities and the current policies and frameworks has strained the government-sector relationship. The Canada Revenue Agency (CRA)’s political-activity audits of charities are just one recent and public example of the dysfunction in the government-sector relationship.6 The debate over advocacy efforts and definitions of ‘political’ activity brought to the surface systemic problems in the relationship that were brewing for years. The perceived ‘advocacy chill’7 demonstrated the acute need to modernize rules and regulations affecting the sector so that organizations can thrive and engage as active participants in a vibrant, healthy democracy. The federal government has not moved forward with sector reform since the Voluntary Sector Initiative (VSI)8 ended in 2005. While the VSI made an impact on the federal policy landscape,9 it fell short of its potential in addressing structural, legislative and regulatory barriers impacting the sector. As a result, discontent with the regulatory and policy environment remains. The current federal government has committed to strengthening the sector by focusing on the issue of public policy engagement, but efforts to reform must not stop there. Recent consultations with sector stakeholders have consistently surfaced a recurring theme – the importance of creating an “enabling environment.” An enabling environment safeguards public interest and supports the sustainability of charities and nonprofits10 while optimizing the policy landscape for innovation and experimentation.